In 2015, as part of a strategy to tackle corruption and modernize Ukraine after the Euromaidan Revolution, two institutions were created from scratch — the National Anti-Corruption Bureau (NABU) and the Specialized Anti-Corruption Prosecutor’s Office (SAPO). Both have the goal of investigating top-level corruption, one of the largest systemic problems in Ukraine, and bringing the top-corrupt to court. This goal will be reached, naturally, if the top-corrupt aren’t able to influence the investigations, i.e. that NABU and SAPO are independent. And that they are, emphasize civil society experts. However, if NABU is praised nearly unconditionally, SAPO is always spoken about with additional remarks – “not totally independent,” “not totally effective.” In the last months, the difference between the two became even more pronounced. The reason for that is compromising information – kompromat – against SAPO head Nazar Kholodnytskyi, revealed by NABU and the Prosecutor’s General Office. Will the spoiled relationship between the two new corruption fighters affect the results of investigations in the end? First, let’s figure out what has happened between the two. What do NABU and SAPO do and why is their work considered a success? maintaining a public prosecution in court in criminal proceedings being investigated by NABU. One of them is Fiscal Service head Roman Nasirov, who is suspected of causing $73.7 mn damage to the state. Another is the gray cardinal of Ukrainian politics Mykola Martynenko who is accused of embezzling more than $17.2 mn from the state enterprise “Eastern Mining and Processing Plant.” There are notable cases against Odesa Mayor Hennady Truhanov, Central Election Commission chairman Mykhailo Okhendovsky and Deputy Defense Minister Ihor Pavlovsky which have not been sent to trial so far. Until recently, it was considered that the main obstacle on the way to justice in cases against the top-corrupts was the lack of the special Anti-Corruption Court which would consider them. Despite President Petro Poroshenko’s claims that judicial reform in Ukraine has been completed, the system has not been changed much, and the cases of top-corruption became getting stuck in courts staffed with politically dependent judges from the old system. The new High Anti-Corruption Court is called to deal specifically with such cases. Its creation was greenlighted in June 2018 with the adoption of laws by the Verkhovna Rada. However, the latest scandal over the SAPO and its head Kholodnytskyi give reasons to suspect that the cases on top-corruption may be stuck even before they get to courts — at the level when SAPO considers them. What is the conflict between NABU and SAPO about? In spring 2018, Kholodnytskyi found bugs in the aquarium in his cabinet. Photo: Ukrayinska Pravda. It turned that NABU asked the Prosecutor General Office the permission to open criminal proceedings against Kholodnytskyi. The Prosecutor General agreed and NABU was sanctioned to bug Kholodnitskyi’s cabinet. The equipment was in the aquarium for a few weeks. Just after the bugs were revealed, Prosecutor General Yuriy Lutsenko, who heads the investigation against Kholodnytskyi, stated that he would appeal for his dismissal. NABU head Artem Sytnyk has the same position. The information revealed with the help of NABU was insufficient to open a criminal case against Kholodnitskyi. However, it was given for analysis to the Qualification-Disciplinary Commission of Public Prosecutors (QDCPP), which might lead to Kholodnytskyi’s dismissal. What was revealed about Kholodnytskyi? The case of a bribe to acting Minister of Healthcare Ulana Suprun. Here, Oleksandr Bohachov, assistant to MP Oleh Liashko, conspired with the mayor of Vyshneve Ilia Dykov, who extorted an apartment from a local construction company. Bohachov allegedly offered the apartment to Suprun. According to the complaint against Kholodnytskyi, the SAPO head later met with the deputy head of the development company, informed him of the details of the case, warned about possible searches, and incited him to give wrong testimonies. Postponing cases and communicating with suspects. The complaint says that once, MP Heorhiy Lohvynskyi came to Kholodnytskyi. The MP asked the SAPO head what he is going to do with the three criminal proceedings where the name of Lohvynskyi appears. Allegedly, Kholodnytskyi answered that “the situation is totally under his control” and later suggested to a prosecutor either to postpone the cases for an indefinite amount of time or to close them. A similar episode is related to the cases involving the owner of the UkrLandFarming agro-holding Oleh Bahmatiuk. Allegedly, Kholodnytskyi persuaded the prosecutors to do the same. According to the NABU, the prosecutors and investigators working on the case decided to continue the investigation, however, Kholodnytskyi withdrew the cases from SAPO’s agency and directed them to investigators of the National Police. The case against Odesa mayor Henadiy Trukhanov. The mayor is suspected of embezzling money from the local budget. According to the NABU complaint, Kholodnytskyi called his deputy Volodymyr Kryvenko to discuss the case against Trukhanov. During the meeting, Kholodnytskyi allegedly tried to persuade Kryvenko not to investigate some of the people involved. In the end, according to the NABU, Kholodnytskyi ordered his deputy to not prosecute Trukhanov and to spoil the documents of the case. Intervention or any other influence of the prosecutor on the official activities of another prosecutor, officers, officers or judges. Is there a real chance Kholodnytskyi will be dismissed? Both NABU and Prosecutor General’s Office filed complains hoping for dismissal of Kholodnytskyi. The Qualification-Disciplinary Commission of Public Prosecutors analyzed them for about 3 months. In the end, it turned out there is insufficient evidence to launch criminal proceedings against Kholodnytskyi. However, it’s enough to dismiss him. Nevertheless, such a scenario is very unlikely. The journalists of Ukrayinska Pravda analyzed the answer of the Commision and came to a conclusion: the things which would make an ordinary prosecutor leave may cost Kholodnytskyi only a reprimand. The conclusion of the QDCPP member consists of 53 pages of fine print. It contains explanations from all of the SAPO prosecutors who appeared in the recordings, the position of Kholodnytskyi himself, information from the Prosecutor General’s Office, recordings of the proceedings and other materials. The journalists pointed out that the explanations of the prosecutors are at times identical and even amusing. This raises suspicions that the defensive line was agreed with the SAPO head. “During the consideration of the petition [on the searches in the company of the developer familiar to Kholodnytskiy – ed] I noted that the petition has to be returned to be reworked because new circumstances appeared… I could not name the particular circumstances because I did not want to tell a judge that a detective hides facts from a prosecutor, as it would create a negative impression about the law enforcement system in general,” goes an explanation of one of the prosecutors. Putting aside the comical aspect of the explanations, according to the journalists, petty offenses like those committed by Kholodnytskyi would lead to dismissal of any prosecutor. But not him. The thing is that when the anti-corruption infrastructure was formed in Ukraine in 2014-2015, the creators of the NABU and SAPO had aimed to make them independent. So according to the legislation, it is not easy to dismiss them. Otherwise, they would not have enough powers to fight top-corruption. The final decision on whether to dismiss Kholodnytskyi is expected from the Commission by July 24. Meanwhile, Vitaliy Shabunin, the head of the NGO Anti-Corruption Action Center (AntAC), one of the initiators of creating the new anti-corruption institutions, wrote a letter to the head of the QDCPP calling to dismiss the SAPO head. He also points out the manipulation in the conclusion of the QDCPP member. What are the possible threats if Kholodnytskyi stays in the office? Since the High Anti-Corruption Court in Ukraine has not been created yet, the main threat for the cases against the top-corrupts has been them for them to get stuck in courts. However, now NABU and the activists fighting corruption are worried that the cases can get stuck or be closed even earlier – on the level when SAPO considers them. “The big cases stopped. This is the problem. Just stopped, ” Ukrayinska Pravda quotes its source within NABU. “Out of the cases signed by SAPO 95% are some current things and 5% are really important documents. And now nobody signs this 5% now,” explains the source. 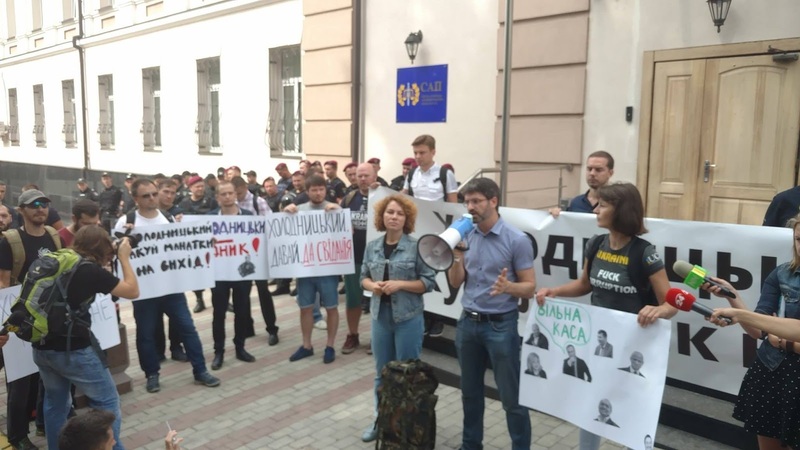 On July 17, the representatives of civil society led by the Anti-Corruption Action Center came to the building of SAPO to protest under the slogan demanding Kholodnytskyi to leave. The last straw for them was the recent decision of SAPO to close the proceeding against Oleksandr Avakov, the son of the Minister of Internal Affairs Arsen Avakov, and Serhiy Chebotar, ex-deputy head of the Minister. In the media, the case received the name “Avakov’s backpacks.” It is related to the embezzlement of UAH 14mn ($533,750). According to the case, in 2015 Avakov Jr., Chebotar and one more person were involved in purchasing backpacks for the National Guard using the money of the Ministry. The price for them was much higher than the market average and the backpacks did not fit the criteria of the Ministry. In April 2018, NABU informed about finishing the pre-trial investigation regarding all the three. The third person involved, an entrepreneur Volodymyr Lytvyn, recognized his responsibility. In the mid July 2018, SAPO closed the case against Avakov Jr. and Chebotar motivating it by the lack of the evidence. During the protest organized by the AntAC another two protests were taking place at the same time and at the same place. They were organized by the ex-head of the National Police Drug Crime Department Illia Kiva, and another one by the provocateur a journalist with TVgolosnaroda Vsevolod Fylymonenko. During the protests, a conflict happened between Shabunin and Kiva and unknown people spilled brilliant green over the AntAC head. The solution of brilliant green is used as an antiseptic medicinal product as well as for disinfection of medical instruments mostly in the post-Soviet countries. It was also spilled on Russian opposition leader Aleksey Navalny. Later, Kholodnytskyi commented the protest denying all the allegations about him covering up corruption. Also he said that he resigns only if the term of his office expires or if he wants it. 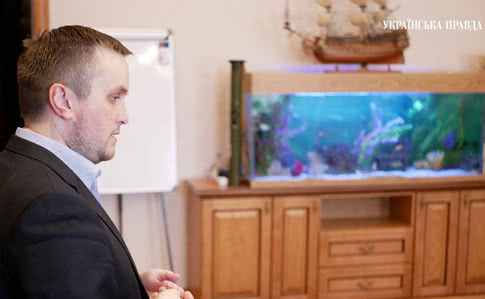 Recently, in an interview with Deutsche Welle, Sytnyk assumed that SAPO is taking revenge on the NABU detectives for the so-called “aquarium case” by opening proceedings against them. In the interview to the same media, Kholodnytskyi called such allegations paranoia. 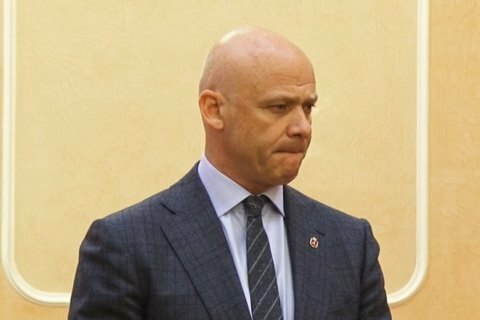 Despite the total miscommunication between the heads of the two institutions, Sytnyk confirms that there are prosecutors in SAPO with whom they used to work, continue to work, and hope to work in the future.